According to the previously classified 28 pages of the Congressional report on 9/11, Saudi Arabia was complicit in the 9/11 attack on America. 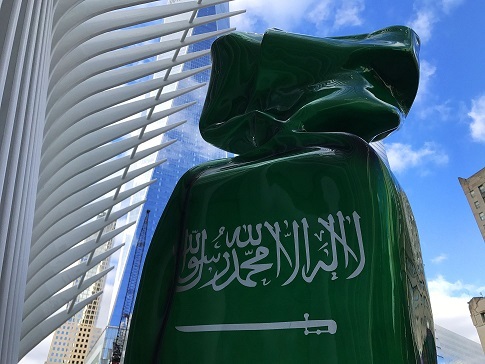 So it is nothing less than a slap in the face of Americans that a sculpture bearing the emerald Saudi flag with a sword and the Arabic inscription, “There is no god but Allah, and Mohammed is the prophet,” was recently erected on the World Trade Center grounds, a stone’s throw away from the 9/11 memorial. Davis Richardson reports for Observer, January 9, 2019, that the 9-foot-tall sculpture, shaped to resemble a piece of candy, celebrates Saudi Arabia’s place in the G20 Summit. It was created by French sculptor Laurence Jenkell in 2011 as part of the larger “Candy Nations” installation depicting G20 countries as sugary delights, and has since been featured in over 25 countries. All 20 sculptures are currently on display outside the Oculus shopping center. 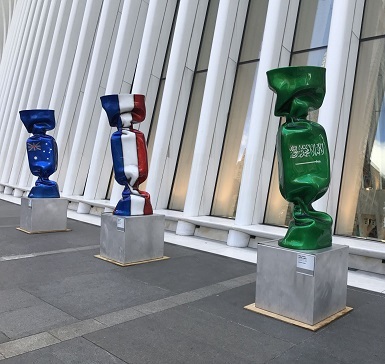 In its continuing efforts to transform the World Trade Center site into a dynamic space in Lower Manhattan, the Port Authority announced that beginning today it will showcase famous candy sculptures around the World Trade Center campus crafted by renowned French artist Laurence Jenkell. Each of the sculptures features flags from countries in the G20 summit, and the art work was commissioned by companies and organizations including the Chanel Foundation, the International Olympic Committee and Coca-Cola. Although the installation was originally created in 2011 to convey “an optimistic message of unity beneath external differences,” its placement at the World Trade Center raises questions given longstanding accusations directed toward Saudi Arabia in the aftermath of the September 11 attacks. In 2003, hundreds of families affected by the 9/11 terror attacks sued the Kingdom over its alleged involvement in harboring terrorism—given that 15 of the 19 hijackers were Saudi. Last March, a U.S. federal judge rejected Saudi Arabia’s motion to drop the charges. This entry was posted in 9/11, conspiracy, Evil, Islam, Saudi Arabia, Terrorism, United States and tagged Laurence Jenkell, Port Authority of New York and New Jersey. Bookmark the permalink. Well, I think Tel Aviv is a bit closer to “The 9-11 Movie”. If there was any Islamic involvement it was very minimal. That’s not to say that equates to “Semitic” involvement (in the sense of Zionism). The whole idea, besides setting the stage for totalitarianism, was to leave the “impression” of Islamic involvement. I don’t think one has to look any further than our “allies” and the alphabet soup “intelligence” agencies here. As long as Jenkell is offending, he may as well be an equal opportunity offender. WHERE’S THE CANDY NATION ISRAEL??? Sign the petition below to impeach the America hating Muslim in Congress. Pass it on. Americans should have been offended when the powerful Muslim lobby the AACL, held a dinner in NYC after the false flag attack on 9/11, honoring their puppets in congress for getting illegal independence for Kosovo, whose terrorist organization the KLA, has ties to the fake terrorist group al-Qaeda who we were told did 9/11, yet our military & Israel’s have and had been helping in Bosnia (pre-al-Qaeda) Kosovo, Macedonia, Libya, & Syria. On 9/11/01 I was working for an engineering firm that got 25% of its revenue from the Port Authority of New York. I knew two of the people that died that day. Shame on them for allowing this. Political Correctness is a self-destructive mental illness. Just digest this a bit and ask yourselves, who votes for creatures like these? The only answer I can come up with is that they want to destroy their own country. Americans need to read Jihad from Muhammad to ISIS by Robert Spencer. No Muslim should hold any political position in our country.